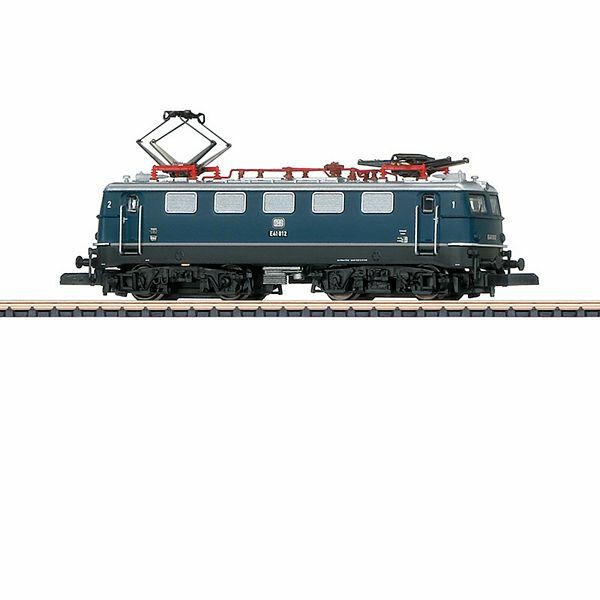 Prototype: German Federal Railroad (DB) class E 41 electric locomotive with three simple lamps, Schweiger air vents with vertical fins, and continuous rain gutter, in a steel blue paint scheme of Era III. Model: The model is completely new tooling. The frame is constructed of metal and the body is made of plastic. The model has a motor with a bell-shaped armature. All axles powered. The headlights are warm white LEDs that change over with the direction of travel. Length over the buffers 71 mm / 2-13/16". One-time production only for members of the Insider Club. The year 1956 was memorable: Triple headlights were introduced on branch lines, there were now only two passenger car classes, and on September 29, the DB took delivery of the first electric locomotive from the new type program – an E 41. Indeed, in Germany steam motive power still accounted for 87 percent of all gross ton kilometers, but for the first time the DB bought more electric locomotives than steam locomotives. "Motive power for the structural transformation" was the message. The smallest new construction electric locomotive with a length of 15.66 meters / 610-3/4" over the buffers, 2,400 kilowatts / 3,217 horsepower hourly output, and a service weight of 67 metric tons fit this image ideally. "Light train service on main and branch lines", was the notation in the type program as the planned application – as a universal type for express, passenger, and freight trains the 451 units purchased between 1956 and 1969 worked as the successor to the E 44 in commuter service between the Alps and the North Sea. "Many club members know the E 41 from their youth as a symbol for the optimistic mood of the Sixties with its reliable design", explains Z Gauge product manager at Märklin Jürgen Faulhaber from discussions. Road number E 41 012 on the roster in 1958 was thus selected as the prototype for the exclusive Club model for 2018. "The four-axle E 41 has become legendary due to the characteristic noise generated when starting up, which has given the units affectionate nicknames such as 'Champagne Corks' or 'Fire Cracker'", reports the Z product manager. He is following a goal with the two exclusive pieces of new tooling for the Club in 2017 and 2018: "Club members can place two top units into service for diesel and electric motive power for commuter service starting at the end of the Fifties. This is in the form of diesel locomotive road number V 80 008 and in 2018 road number E 41 012." Folklore Banging and Tractive Effort Jolts The German Federal Railroad laid great value on extensive standardization of electrical and mechanical parts for the modernization of its motive power with electric locomotives. The reason for this was to minimize spare parts inventories. Siemens/Krauss Maffei developed the classes E 10 and E 40, and AEG/Krupp the class E 50 heavy freight locomotive. Henschel and Brown, Boveri & Cie designed the class E 41 with the DB. The E 41 had an axle load of 16.8 metric tons and was up to any task on electrified lines. The E 41 shared with its sibling classes the clean lines of the locomotive body welded to the bridge frame with its hollow girders as well as standardized components such as drive mechanism or axle bearings. However, there were also many departures from the other new construction locomotive designs to save costs. The E 41 thus did not have a high-voltage control installed, but rather a simple low-voltage control. The relay system had physical and acoustic effects for passengers: When the locomotive was accelerating a pushed shuttle train, the coarse switching steps in the relays caused rough pushing from the locomotive and a magnetic field in the current divider led to a loud bang when the relays were switching. Yet, these surrounding circumstances had if anything folklore characteristics and affected in no way the use of the ubiquitous units of this class with their speed of 120 kilometers per hour / 75 miles per hour.